So I was reading the link sent by @WRSA at American Partisan, and was looking into Comms gear. Specifically I was looking at a Yaesu VX-6R. It occurred to me that this, like so much other electronic equipment, has a unique rechargeable battery, which is nice. But we have a load of AA and AAA batteries in the house, and any Comms gear needs to be functional in a grid-down situation. Do y’all know of high-end portable Comms gear that will function on standard batteries as well as their unique battery? Bull. The airport authorities know that weapons being on board the plane is no reason to bar the plane from entry. The weapons have their bolt removed and have no ammunition. This is done before they ever leave the theater. The airport authorities know this. I have covered this in my most recent post (followup to the one backtracked to Michelle’s site). Further, not having been screened by TSA is quite irrelevant, and the airport authorities know it. Customs does a more thorough job with them. This story is crap. Sorry. Never let the facts get in the way of a good “The Bay Area hates the troops” story, I suppose. I don’t mean to be rude, but you need to learn to stay on point and not get sidetracked by irrelevant things. I never said anything about contractors trucking people around and such as that. I stuck to a single point in both of my posts: weapons being on board causing a security concern, and this being the reason for stopping the aircraft. Again, bull. Period. They have more muzzle discipline that an air marshal who also has a weapon, and besides, unlike air marshals, they have no ammunition. There was and is no security concern. Do they honestly believe that anyone would be stupid enough to allow the Marines to board the aircraft in the theater WITH ammunition? No, they do not honestly believe that. And that’s the point. I’ll go ahead and sidestep your faux courtesy and be rude. Hey. A**hole. Spare me the smarm. The point about the contractor driving the 3 troops to see their loved ones, and the part about the commanding officer saying they didn’t need anything else, means that the entire incident was completely overblown. If the commanding officer says, (sic) we don’t need to go to the terminal, that’s fine. Then that’s it. End of story. But people like you and Ledeen and Malkin can’t resist the urge to bash the bay, even when the facts get in your way (go look up Tight Films’ statement on the Marine commercial in SF, schmuck). The point about the Staff Sgt.’s comment about the 2005 arrival was that your assumptions about the Bay Area are, of course, wrong. “I have never had so many people in my 17 years of service stop and thank me for my service,” said Maj. Sean Pascoli, the officer in charge of recruiting for the Marine Corps in the Bay Area. Pascoli says he has exceeded his quota for Marine recruits in the Bay Area this year. …and tell me the Bay still hates the Marines. Well, frankly I had not considered the actual size of the assault team. Mr. Jimenez recommends a squad (this is three fire teams and a squad leader, usually a Sergeant). I think a fire team of four Marines might be sufficient, but based on Mr. Kimes’ concerns, the post-assault occupation might take a larger force size. Or maybe not. But while the first letter from Mr. Kimes brought a smile to my face, this last one brought a tear to my eye. He favorably compared me to Ledeen and Malkin. I am undeserving of such a compliment. I expect a dinner invitation from Michael and Michelle soon. I am in the club – I am one of you now. Thank you, Mr. Jimenez. 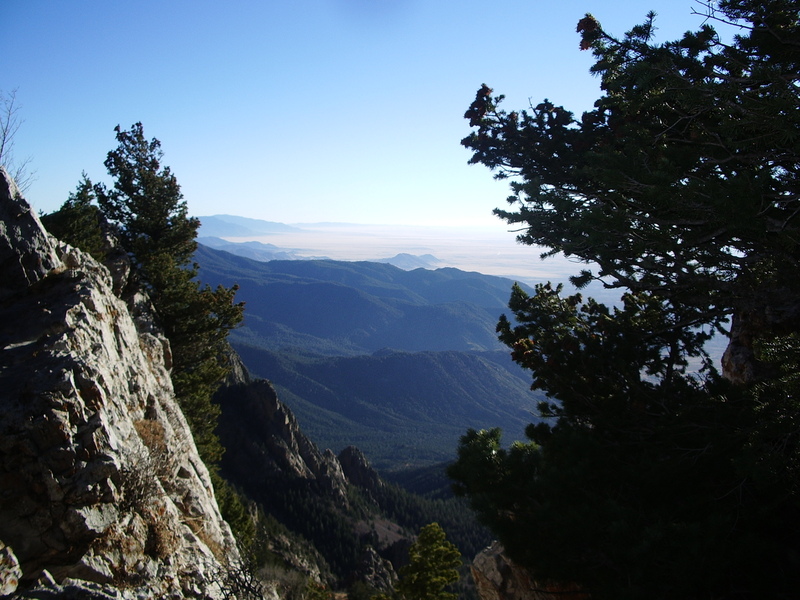 Somewhere on the Crest Trail, Sandia Mountains, New Mexico, November 16, 2006. Hiking at 10,000 feet elevation kept me winded most of the time. Since 1993 I have been arguing that Gulf War Syndrome, or “Gulf Lore Syndrome” as I titled one of my articles, is a myth. I wrote almost 30 articles on the subject. And I received the sort of invective you’d expect, questioning my patriotism and loyalty to the troops for putting science ahead of hysteria and political considerations. Now the Institute of Medicine has released a report based on a review of 850 studies and found “the results of that research indicate that … there is not a unique symptom complex (or syndrome) in deployed Gulf War veterans.” Of course, out of 700,000 men and women who went over some have fallen ill and some have died. It’s been 15 years, after all. But they don’t have anything non-deployed vets have, or for that matter civilians. Not that this will stop the activists, one of whom, Cpt. Joyce Riley, is being routinely identified in stories about the IOM report as a Gulf vet even though she never got closer to the war than San Diego. Riley, who also claims Henry Kissinger ordered the invention of HIV/AIDS, sees this latest report as nothing more than part of a grand conspiracy. In fact, “GWS” is actually part of a conspiracy of sorts — a conspiracy to continually fabricate one syndrome after another by pretending that normal background rates of illness combined with hysterical reports (such as one vet’s claim to have glowing vomit) indicate mass mystery illnesses. It began with Agent Orange and in its most recent guise is called World Trade Center Illness. But it’s all the same nonsense. And nobody suffers more than the exploited alleged victims whose lives can be ruined by the constant psychological battering of being told they have or may have a disease that doesn’t even exist. Sigh. Well, there goes my lawsuit. And it was such an open and shut case too! Hangs head … shuffles off. Following the counsel of John Hawkins at RWN, I am listing my top ten blogs. Since my son is a Marine, it will be virtually impossible to unseat SWJ from the number one position (especially the Daily News Links page where you just point and click on the day you want). I am personally invested in what the USMC does — my son’s life hangs in the balance. Numbers 2 – 10 are subject to revision at any time. 10] Blogs of War (and companion site, Chronicles of War; friend John Little has been very kind to me, instructive when I started up, and very nice to blogroll my site). Actually, I am taking liberty with my number one blog, since it is only barely a blog, linking to a bunch of stuff, including books, news, manuals, quotes, discussion threads and blogs by others. I hope that this liberty is okay. It is a must read every day for me. I have always been fascinated by the extent to which people willingly believe myths. Courtesy of Right Wing News I found this interesting piece of history — history that you will never see in the textbooks (and NPR and Bill Moyer will never cover it). If you are unfamiliar with the history of blacks who fought for the Confederacy, here is an informative video. Enjoy engrossing presentations by two black scholars who share their vast knowledge of the South. Professor Edward C. Smith is Director of American Studies at American University in Washington, DC, and Nelson Winbush is a retired school teacher . Cutting through what he calls the “mythology” that passes for history, Smith shares some little known facts about the pre-Civil War period. “Let us look at the total population of Washington, DC from 1800 until 1870. In 1800, when the city first became the nation’s capital, there were 746 blacks living in the city, of which 123 were free; 620 were slaves. The black population steadily increased, as well as the free black population. By 1830, a dramatic change had taken place. Now there are nearly 6,000 blacks, of which well over 3,000 are free. Remember, the Civil War was not to begin for another 31 years. By the time we get to 1860, there are almost 11,000 blacks living in Washington, more than 9,000 of them are free, and fewer than 2,000 are slaves. And this was happening all over the South. By the time the United States Census was taken in 1860, there were over 500,000 free blacks scattered throughout the South. Allow me to give one more example; this one is completely unrelated by subject, but very much related by analogy. It is the myth that Galileo and the church were at ideological war with each other, the church having muzzled the exercise of science. Nothing could be further from the truth, inasmuch as Galileo’s true enemies were his scientific detractors who used the church as a way to silence him. Thomas Lessl has two great pieces on it here and here. Jonah Goldberg has an NRO article on it here. As I said, it is unrelated to the issue of the Civil War and slavery, but it goes to show that the myth (that every school child is taught) about Galileo and the church is false, yet believed by so many people today that it is not likely ever to be expunged from the public consciousness. I know my place on the food chain. I am still a very small blog, and it will likely remain that way. I do not do this professionally (I am a working stiff), and I want to put quality posts on the site, so that limits the amount of posts I can make (and even so, I sometimes do not have the time to make my posts the quality that I want). Spam Karma 2 has caught 353 spams. And according to Technorati, we have had 72 incoming links. This isn’t so bad for 72 days in operation. I especially appreciate my repeat readers. I see you out there in the blogosphere.